If there’s one thing competitive gaming has been sorely missing out on, it’s clearly been fencing. Okay maybe not but either way developer Messhof is here to fill the void with Nidhogg. This fun little game is all about fast reflexes, strategy, running away and getting eaten by giant worm creatures. Literally. Nidhogg is an incredibly simple game. Two people enter an arena with the goal of getting past the other. Whoever gets the first kill gets the green flag to push into the opponent’s territory. However, every kill will dictate who is on offense and defense. This leads to a game where the tides can turn quickly and wildly at any moment. On offense you simply need to get by your enemy any way possible. This can mean killing him, evading him or perhaps just disarming him and running away. Respawns are quick though, so when you do get by him it won’t take long for him to reappear in front of you again. On defense you really only have one goal: kill. By killing your opponent you gain control and can work towards pushing him back into his own territory. Eventually, after you have pushed through three or four enemy screens you will win the match, which is oddly rewarded by your character being devoured by a large worm creature, the game’s titular Nidhogg. The game’s simple concept is handled through similarly simple controls. You spawn with a sword and attacking your enemy is generally done by flicking up and down to change your sword height, then jabbing. However, once you toss in ducking, rolling, jumping, disarming, throwing swords and hand to hand combat, there ends up being a good amount of strategy in how you attack your foe. It also feels supremely balanced with no single ability being overused or overpowered. The style of the game complements the simple premise and controls well. These are true 8 bit graphics. The characters are solid colors and slaying your enemy leads to an explosion of color that paints the ground. Other elements are crude yet effective and each of the four stages stand apart from the others, with their own defining elements. The music – done by Daedelus – works well and will dynamically shift to match the gameplay. 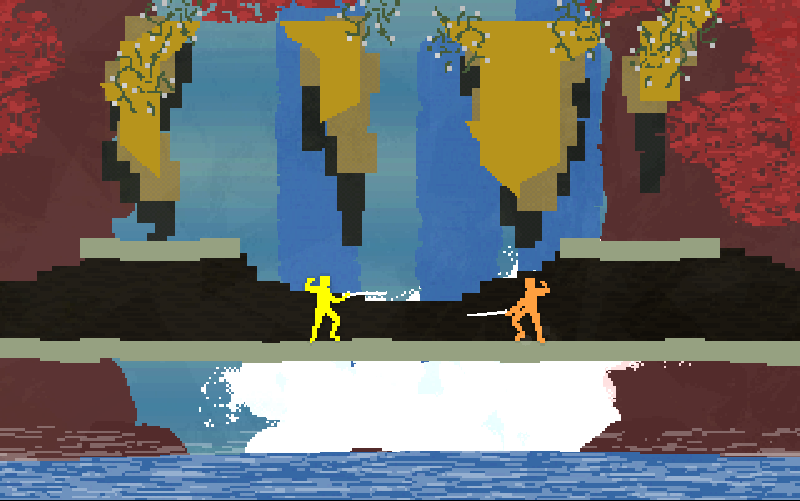 The main idea of Nidhogg is side-by-side competition with another player – it even states so in the game’s description – and it is easily where the game shines. The matches are highly tense and ridiculously fun in this setting. Playing next to a buddy also offers a wide range of options to alter how you play including low gravity, slow mode, boomerang sword and many more. There is also a built-in tournament mode included for those who are looking to make a party out of things. Other modes of play, however, are sadly disappointing. Online multiplayer misses most of this fun with a general lack of communication and lag issues that hamper the whole experience. There is also a single player mode which boils down to just playing through the game’s four stages several times with increasingly craftier AI opponents. It only takes about 45 minutes to beat, although the main draw for single player is based on speed runs and climbing leaderboards. Nidhogg has all of the makings of a great indie title but it unfortunately never finds its footing. The experience of playing Nidhogg is something that is really only enjoyable when playing with someone next to you, which is becoming increasingly rare for gamers these days, especially on PC. Even with that limited appeal, there is not much depth to the game beyond the quick pick up and play versus mode against a friend. A true single-player narrative and improved net code would lead to a complete experience. But as it sits, Nidhogg feels like you’re simply playing a side mode from a larger game; albeit a ridiculously fun side mode under the correct circumstances. A code for Nidhogg was provided to Pixel Related for review. Tags: Messhof, Nidhogg. Bookmark the permalink.